When installing a roof on a new home or doing re-roofing on your current structure, there are few roads that you can go down. While you may have heard of roofing professionals, have you heard of roof plumbing? 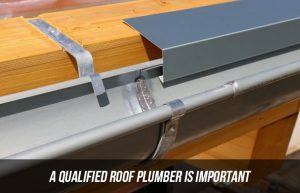 Roof plumbers are the qualified professionals that the water flows correctly off your roof, down to the gutters and into the downpipes, and not ending up inside your house or creating a deluge over the sides of the gutters. Having a Roof Plumber investigate and quote on your roofing needs will ensure that you have the right solution for your roof. You want to get it right the first time! There are many roofing professionals around, but it’s not always easy to work out who will give you the best possible roof that meets Australian Standards and will last. Rather than take the risk, get a professional from the start and save yourself a lot of wasted time and money. Choosing a roof plumber instead of just a regular roofer is the first part of the equation. The second is going with a trusted and professional company, will ensure your roof is up to Australian Standards, and who will stand by their work. If you are interested in reading some testimonials and seeing some photos of our past works, then you can do that right here. We have qualified metal roof plumbers on hand to ensure that every roof we put on meets Australian Standards, looks good and will cope with the both the usual and unusual Australian weather – we are dedicated to putting on roofs that will hold up regardless of the circumstances. Get in contact with All Roofing Services via our Contact Form, call us or send us an SMS for a free quote on our roofing services for your home. To Repair Your Roof Or Replace?